Indian smartphone manufacturer Xolo has just announced their next smartphone, the dual-SIM Play 8X-1100. The new smartphone is an upgrade to the Play 8X-1000 featuring a higher specification processor and camera. The new 1100 is based around a MediaTek octa-core processor clocked at up to 1.7 GHz and has 2 GB of RAM. It has a 5.0-inch, 1080p screen protected by Corning Gorilla Glass 3, 16 GB of internal memory supplemented by a MicroSD card slot. On the back you'll find a 13 MP Sony Exmor RS camera replacing the previous generation's 8 MP camera. If you're into your selfies, you'll be pleased to find a 5 MP BSI (back-illuminated sensor, a way to improve low light photographs by letting more light onto the sensor) camera on the front. Audiophiles are catered for with dual speakers, DTS Surround Sound and a dedicated audio DAC (digital-to-analog converter) made by well-respected Edinburgh-based Wolfson Microelectronics. 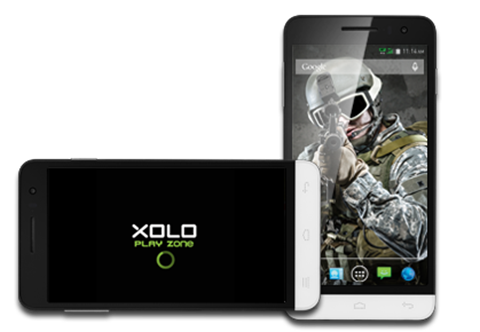 The 8X-1100 is being pitched to gamers with Xolo marketing the 700 MHz Mali 450 GPU, but also exclusive access to the XOLO Play Zone, giving users the ability to download and play games from what Xolo describes as a "huge collection" of HD titles. We know that the 1100 will come with Android 4.4 KitKat but Xolo haven't announced if it'll come with their Hive overlay. The 8X-1100 also comes with MediaTek's latest file sharing technology, called Hotknot, which Xolo is marketing as being up to five times faster than Bluetooth. You would be forgiven for not having heard about Hotknot as it is a relatively new technology that's something of a competitor to NFC, Near Field Communication. Hotknot is also a wireless, short ranged radio that may be used to pair devices or transfer files, but there are some key differences. One is that NFC requires an antenna and the necessary chip to enable the feature, whereas Hotknot is built into the screen and associated components. Hotknot and the rapid advancement of the Xolo smartphone range is a great showcase for the innovation from the developing smartphone markets: Hotknot was announced at the end of 2013 and sniffily dismissed by Western smartphone analysts as being too slow for anything other than pairing, but here Xolo have taken a technology and made it work. One point that I did not mention is the price, which is just 14,999 Indian Rupees. That's about £150 or $250; buyers will be getting a lot of smartphone hardware for not very much money.